Gymnema sylvestre is a woody climbing shrub native to India and Africa. Gymnema leaves have a long history of use in India’s Ayurvedic medicine. The Hindi name, gurmar, means "destroyer of sugar". G. sylvestre leaves naturally contain a single iminosugar (BR1) that has been shown to control blood sugar levels by PhytoQuest scientists (PCT/GB2009/000417). Gymnema also contains saponins (e.g. gymnemic acids) that block sugar perception and are highly concentrated in most Gymnema products (from around 1% to often 75%) to the exclusion of the iminosugar. We have shown that the iminosugar is all that is needed to control blood sugar. Our product contains an unconcentrated extract of Gymnema containing the iminosugar and saponins for a full range of the natural effects. The extract is quality controlled to contain > 1% iminosugar BR1. BR1 also decreases the activity of beta-glucuronidase and hexosaminidase that are elevated in diabetes. Inhibiting beta-glucuronidase levels may help efficiency of excretion of metabolic toxins from the body and aid the health of the crucial insulin-producing beta-cells. Gymnema sylvestre has been shown to lead to regeneration of beta-cells in animal studies making it a potential cure for diabetes type 1 and 2 and diabetic humans can reduce insulin doses over a period of time (e.g. see Baskaran et al., 1990, J. Ethnopharmacol.. 3, 295; Snigur et al., 2008, Morfologiia 133, 60). Although gymnemic acids of Gymnema are widely reported for their beneficial effects, most studies involve either impure, poorly defined mixtures which usually do not include the iminosugar or the researchers extrapolate from cell-based studies where the saponins do not need to enter the blood stream. The iminosugar BR1 readily enters the blood stream and is distributed around the body and so can reach the pancreas and beta cells before being eventually excreted unchanged. This product is a nutritional supplement and should be taken as part of a balanced diet and lifestyle. It is not recommended for children or pregnant women. Do not exceed the recommended dose of 2 capsules per day. The product contains chromium initially to act as an aid in maintaining a balance of blood glucose. Chromium – occurs in nature and is sometimes called GTF (glucose tolerance factor) and contributes to the maintenance of a normal glycaemic control. The NRV (nutrient reference value) in Europe is 0.04mg/day and is provided in our capsules. 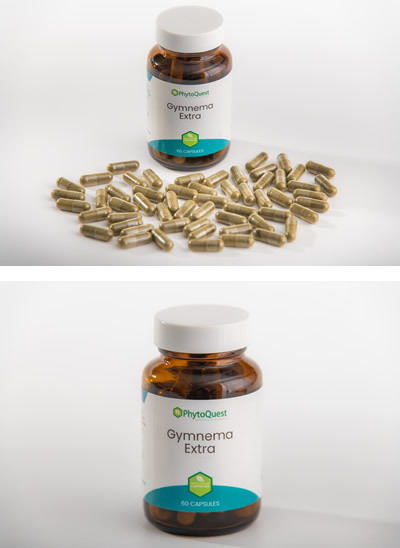 RRP Gymnema Extra for bottle of 60 capsules £30.00. Contact us for further retail information. Baskaran, K., Ahamath, K.B., Radha Shanmugasundaram, R.K., Shanmugasundaram, E.R. (1990) Antidiabetic effect of a leaf extract from Gymnema sylvestre in non-insulin-dependent diabetes mellitus patients. J Ethnopharmacol. (3):295-300. Snigur, G.L., Samokhina, M.P., Pisarev, V.B., Spasov, A.A., Bulanov, A.E. (2008) Structural alterations in pancreatic islets in streptozotocin-induced diabetic rats treated with of bioactive additive on the basis of Gymnema sylvestre. Morfologiia 133: 60-64.